Low Cost Shuttle Transfers From Palma Airport! Palma International Airport (PMI), is situated approximately 8 klms (5 miles) to the East of Palma itself which makes the airport an ideal gateway for a short break to the wonderful island of Majorca/Mallorca and the city of Palma itself. It is also the ideal airport to access the many fantastic holiday resorts that are located on the island such as, Cala d’Or, Cala Millor, Cala Ratjada, Magaluf, Palma Nova, Peguera, Port de Pollenca and Puerto Alcudia to mention just a few. Yes, the airport of Palma is also known as ‘Son Sant Joan Airport’ or ‘Aeroport de Son Sant Joan’ in Spanish. 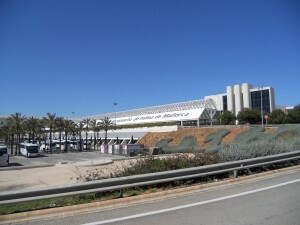 Palma De Mallorca Airport, is the third largest of all the airports in Spain and as a result, is one of Spain’s busiest airports, especially during the summer months. The airport has over 21 million passengers passing through it each year and is a popular destination for both holiday makers and business professionals. The added bonus of Palma airport, is that it is only a few miles away from the nearest holiday resort of Can Pastilla and literally only takes a few minutes to reach from the airport. This is ideal if you are wanting a few days in the sun, on the beach and with minimum transfer travel time to maximise your holiday time. It is also the perfect resort if you have children and do not want to put them under the stress of long hot transfers on coaches or in taxis during the summer months. There is a public bus that runs from the airport to Can Pastilla at regular intervals throughout the day and night and is very cheap in terms of bus fare. 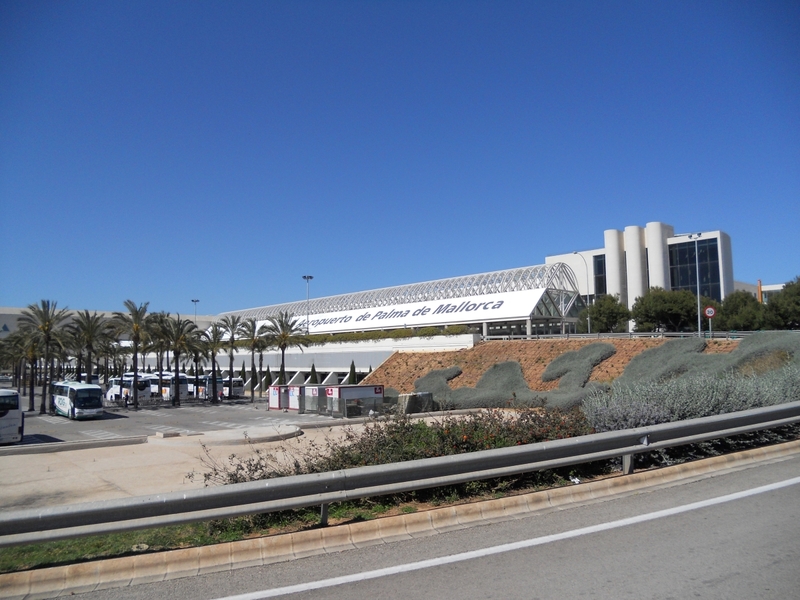 Palma De Mallorca airport is a large and modern airport which has one main terminal building and then 4 boarding modules A,B,C & D. The ‘Modules’themselves all have their own facilities such as shops, cafes and all have arrival and departure areas. Yes, Palma De Mallorca Airport is open 24 hours. As Palma Airport is one of Europes busiest airports, it needs to provide efficient and reliable services to passengers wanting to reach the many different destinations on the island. Due to the sheer volume of passengers that arrive at Palma De Mallorca airport throughout the year, the ground support network that is in place at the airport, makes getting to and from Palma airport very easy. Passengers arriving at Palma airport have a number of options for transfer such as car hire, bus, coach and taxi. A popular choice for many passengers landing at Palma De Mallorca airport is car rental, especially with passengers in small groups. Car hire certainly appeals to people who wish to explore more of the island and visit some of the beautiful sights it has to offer. A regular bus service connects passengers from Palma De Mallorca airport to the city centre and port. The bus leaves from the airport every 15 minutes and runs from 06.30am – 02.15am daily. This is certainly a cheap option for transfer, especially if you are traveling alone and just want to reach the city centre. There are also buses that run on a regular basis from the airport to the near holiday resorts of Can Pastilla and S.Arenal. The Palma airport buses depart from outside the main airport terminal. Once you exit the terminal building you will see the bus stops directly opposite. There are signs to direct you to the bus stops once you are outside the terminal. A popular choice of transport from the airport is one of the shuttle services that are run by several companies who operate from the airport. You can pre-book your airport shuttle in advance and it will be at the airport waiting for you upon your arrival at Palma. Most shuttle services will collect you from the airport and take you to your hotel and then collect you from your hotel on your day of departure and then take you to the airport. Taxis can be found outside the main arrivals hall at the airport. It is always advisable to ask how much the fare will be before entering the taxi. However, inside the terminal building, you will see many signs that actually tell you how much the taxis fares to several destinations should be. There is no direct rail link connecting Palma De Mallorca airport with the city or any other destinations on the island. Passengers wishing to catch a train to their final destination, will need to make their way to the main train station in Palma. This can be done by taking the bus from outside the airport to the centre of Palma and then making your way to the train station. Once at the train station in the centre of Palma, it is possible to then catch trains to many of the popular towns throughout the island. The train station and the main coach station in Palma are link, so it is also possible to catch a coach to the many destinations and towns on the island. The distance from Palma De Mallorca to the resort of Cala D’or is approximately 60klms (37 miles). However, the transfer time to the resort of of Cala D’or from Palm Airport can take between 1-2 hours simply because of the roads. Passengers arriving at the airport have several options in terms of transfers such as taxi, car rental or coach. It is possible to keep informed and up to date with all the latest Arrivals and departures information for Palma Airport. To keep informed or simply track a flight, please click on one of the following links below and it will take you to the relavent page for live up to date information on all flight arrivals and departures at Palma airport. There are a wide number of airlines that fly to Palma and many of the low budget airlines such as Ryanair, Easyjet, Jet2 and Flybe also have scheduled flights throughout the year. Many of the holiday companies such as Thomson and Thomas cook all have charter flights to palma during the peak season. No, there are no hotels actually onsite at the airport but there are plenty of cheap hotels near Palma airport to choose from. If you are looking to stay at one of the hotels close to the airport and wish to see which are the best deals for your dates, we have provided a couple of links for you to the right. If you are looking for hotels with airport shuttle, it is advisable to contact the hotel to see if they offer a shuttle service to and from the airport. If not, there are several companies that offer affordable shuttle services from Palma Airport. There are a number of hotels situated to the airport and the hotels in Can Pastilla are within easy access of the airport. Hotel Linda in Can Pastilla is a popular choice with many passengers because it is close to the airport and also the airport bus stops right outside the hotel. The closest holiday resorts to Palma airport are Can Pastilla and S.Arenal. Can Pastilla is situated just a few miles from the airport and only takes 5-10 minutes to reach by bus. S.Arenal is just a couple of miles along the coast from Can Pastilla and the two are linked with a promenade. Yes, the airport does have Wifi and the first 15 minutes is free after the first 15 minutes, you will be required to pay for the WiFi. There are also several coin operated Internet facilities throughout the airport that are available to passengers. Yes, there are a couple of VIP Lounges at Palma De Mallorca Airport and they are both located Airside. The airport Lounges at Palma Airport offer all the facilities you would expect from an Airport Lounge and if you do not hold a valid Boarding Pass that entitles you entry to the Lounges, you can either book your entry online or you can pay on the door at the airport. Yes, there are several ATM’s (Cash Machines) located throughout the airport terminal at Palma and if you are wishing to withdraw cash upon your arrival at the airport in Palma, you can do so at one of the ATM’s which are located in the Baggage Reclaim Area or in the main Arrivals Area at Palma airport. There are also ATM’s located in the Departures hall and also near the Boarding Gates. Yes, children are well catered for at the airport and there are several play areas that are designated for children throughout the airport. Yes, there are several Currency Exchanges at the airport but you are advised to either exchange your money prior to arrival at the airport if you want to get the best exchange rates. Unfortunately there are no facilities at the airport for you to leave your luggage. Throughout the airport there are a large variety of shops selling a wide range of products. There are shops in the Arrivals Area at the airport, the Departures area and also in the main Arrivals Lobby. The shops inside the airport at Palma De Mallorca consist of Duty Free shops, Newsagents, Jewellery & gift shops, shops selling Fashion, Handicrafts, sunglasses & travel goods. There are also Chemists located inside the airport terminals. One thing is for certain, you will never be stuck for things to do in Palma De Mallorca. No matter what your age or interests may be, there will be something that will suit you. Whether you are looking for nice beaches, historic architecture, nice restaurants, picturesque landscapes or bars and clubs, you will not be disappointed. Palma De Mallorca is a great island to visit all year round. Its pleasant climate throughout the year attracts a wide range of visitors and whether you are wanting to spend long relaxing days on the beach or want to explore the sights, you will be able to choose the best month to suit you!